Hello and welcome to my website. 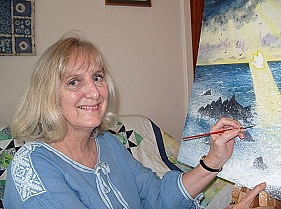 I’m Rohana Darlington, an artist, designer, writer and therapist. My work is inspired by the countryside, the changing seasons and my love of the beautiful and sacred in everyday life. Born in India, I spent my childhood in the Far East before training in publishing and then graduating in Textile and Fashion Design at Central St Martin’s in London. I worked for national magazines, fashion companies and at Manchester Metropolitan University as a design lecturer until I married. Then we moved to Cheshire to bring up our four children. Here I immersed myself in the area’s history and stunningly beautiful landscapes. Later I graduated in medicine and homeopathy and worked as a hospital-based creative therapist where I further developed my love of arts, crafts, healing and creative writing. I designed my website to share my ideas and artwork in six separate categories: landscapes, seascapes, buildings, floral studies, crafts and art inspired by sacred themes. I also write a monthly blog where I offer nature observations, recipes, health-care hints and arts and craft projects. In addition there are links to my publications: craft books, children’s picture books and a historical novel set in Cheshire. Recently we moved to Hampshire to be nearer our family and the landscape, seascapes and history of this area are providing me with a whole new source of inspiration.